As a busy Mom of four I'm always looking for a good excuse for a Ladies Night Out, and that was part of the inspiration behind CommonGround Iowa's inaugural Ladies Night Out: Banquet in the Field. I am a volunteer with the national CommonGround program, which brings together women farmers from across the United States, to share about the food we grow and how we produce it. 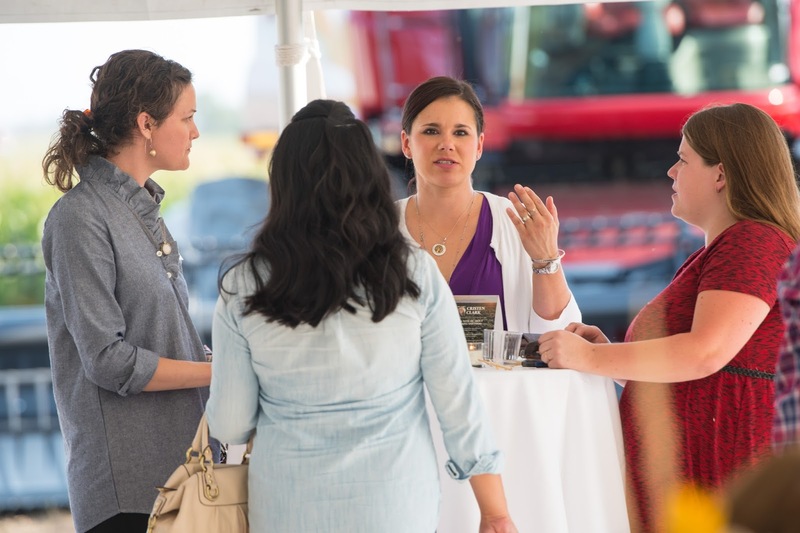 Our goal is to have conversations to help consumers sort through the myths and misinformation surrounding food and farming. There are twelve volunteers in the state of Iowa. 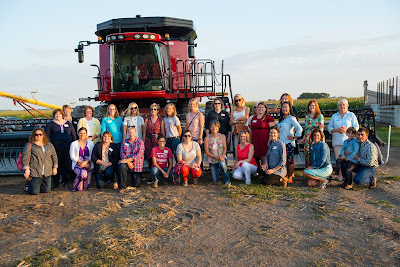 Last year after harvest we got together and decided we wanted to create an event where we could foster relationships with other women in Iowa and talk about food, farming and family. One of our volunteers, Kellie Blair, volunteered to host the event, and from there the event that brought together 40 women from Central Iowa (and four men - all with the last name Blair and our photographer 😉) got its roots. The evening started off with appetizers and small chat over wine. It was great to meet a wide variety of women - teachers, legislators, marketing professionals, business owners, pastors, etc. 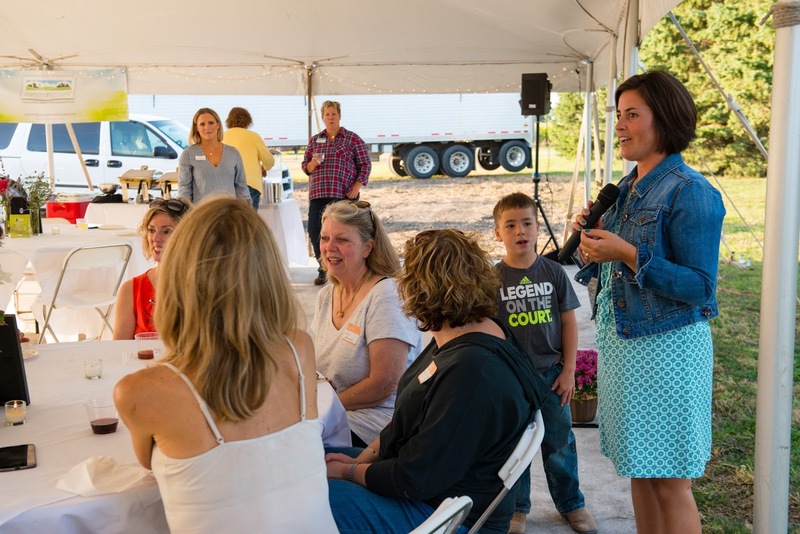 After everyone arrived and had their fill of appetizers, Kellie welcomed everyone to their corn, soybean, pig and cattle farm. Kellie and her husband AJ took the group around to checkout some of their equipment and cattle, as well as answer questions about some of their farming practices and technologies used. Then it was time for supper to be served. The menu included amazing smoked beef tri tip, roasted pork tenderloin, marinated garden vegetables with edamame, and dauphinoise potatoes. I have to specifically name the menu because it was delicious and perfect for a ladies night out! Following supper there was a short program which included AE Dairy President & CEO Miriam Erickson Brown. It was great to catch up with both her and AE Dairy Director of Marketing Kim Peter that evening, and for Miriam to share the AE Dairy story with all of the attendees. 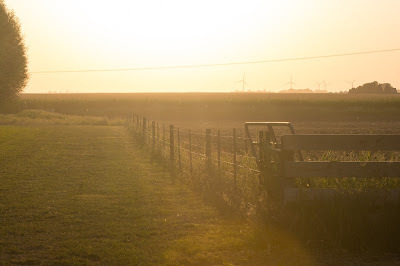 AE Dairy has made changes over the decades to reflect trends but one thing remains the same, their passion for quality and that starts with the cows on the Iowa dairy farms they source their milk from. I also loved that she shared about being a third generation family business owner. But you want to know what my favorite part of the evening was??? It was the dessert! And not just because the warm apple crisp and vanilla ice cream were once again delicious; it was because of the conversations held sitting at the tables or standing in line to get more ice cream. 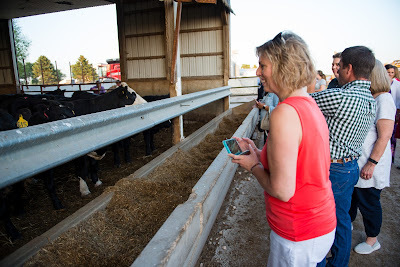 After a couple hours of dinning and hearing about all of the volunteers' farms, the women in attendance had lots of questions and were interested in learning more. Our intimate setting was the perfect spot for everyone to feel comfortable to ask any question and have discussions about food and farming. There were so many connections made that evening. Thank you to Kellie and AJ for being our gracious hosts. You both were great at sharing about your farm with everyone. Thanks to my fellow CommonGround Iowa volunteers for working on everything from the invite list, to bringing flowers from their personal gardens to use as table decorations. Thank you to our CommonGround staff for making arrangements for things like a tent, tables and chairs, and for taking our ideas and transforming them into something tangible. And lastly, thanks to all of the women who shared their Friday night with us. 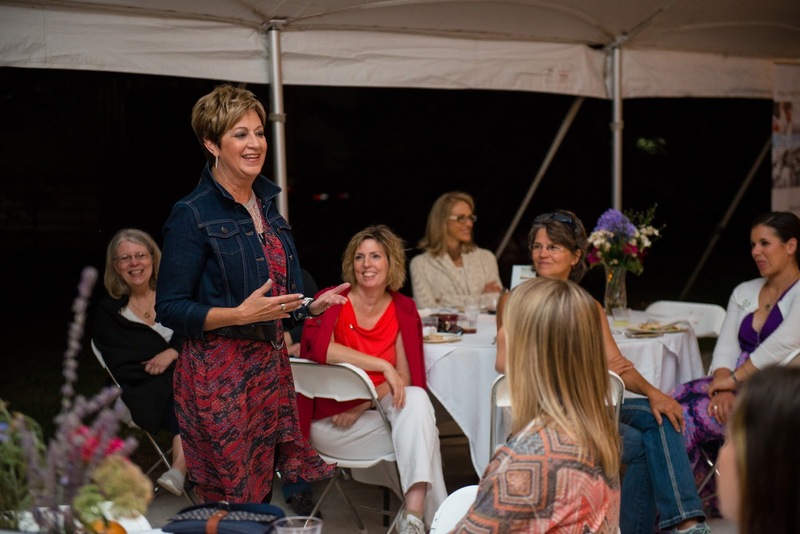 I hope you had a great Ladies Night Out and I can't wait for the 2nd Annual event next year! Have you ever been to a Ladies Night Out on a farm? 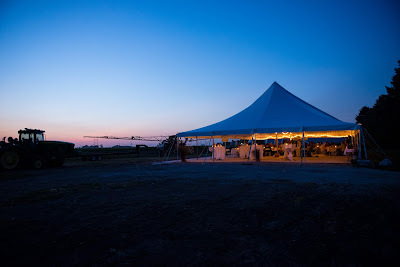 Have you ever been to a Banquet in a Field? Share about your experiences in the comments section. And if you haven't been to an event like this and would like to, let me know that as well! Remember to Comment for a Cause! since you had Miriam there, I was wondering if the whole issue of their HFCS and 'no hormones' labeling came up. She was on the farm, learning, listening to farmers, so perhaps they could see that such a label isn't necessary and can be divisive for the farming community. I was just wondering if that came up during dinner. What a lovely event! Love this blog entry and thanks for all the great work you do, Val! That wasn't brought up. It might be a conversation the group could have with AE later though. What a fantastic evening and bummed I missed it! Hopefully next year! Yes! We'll get you on the invite list!